EPC Group provides for industry leading upgrade and migration services for both SharePoint 2010 (SharePoint Server or Foundation) and SharePoint 2007 (SharePoint Server or WSS 3.0) into SharePoint 2019 and/or Office 365. We will work with you to help define the overall scope as well as identifying the underlying tasks and milestones that will be required to meet your objectives. Are there existing custom features or workflows that are required to be “interoperable” between your existing SharePoint 2010 platform and the new SharePoint 2019 and/or Office 365 environment? 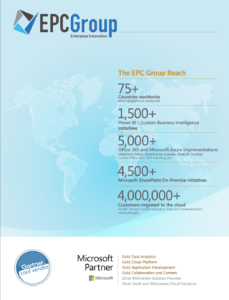 EPC Group has experience in upgrade and migration initiatives of any size from both a “total user base” perspective as well as a “content database and sizing” perspective. We also provide for solutions to organization’s who may have “known migration issues” such as RBS configurations and related SQL Server database “flags” that must be resolved or customizations that must be rearchitected or deprecated and then implemented within the new SharePoint 2019 framework. EPC Group’s senior SharePoint and Office 365 architects and development teams can provide you with solutions to resolve most any issues you are facing as we have experience on hundreds of previous SharePoint upgrade and migration efforts and pull from these “from the consulting trenches” strategies and lessons learned to know you are engaging with a trusted partner that will ensure your high-profile project is a success. We focus on accelerating migration and technology upgrades while reducing risk through dedicated experts, proven methodologies and strategies. We work alongside your team to ensure migration support, advisory, consulting and strategy meet the needs of your business such.